This book is one part research studies, one part interviews and focus groups, and one part experience. It uses available research on Congress and its decision making. Dozens of elected officials, including members of Congress, and their staff agreed to off-the-record interviews and discussed the factors that contribute to their decision-making process. 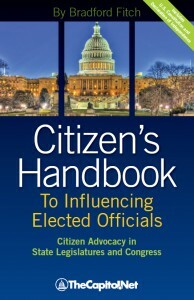 For complete Table of Contents, sample sections, and secure online ordering, see CitizensHandbook.com.